The Horn Nova 1081 - with the long airlifter for your long arm sewing machine! With the Horn NOVA 1081 you can store both your sewing machine, overlocker and all your vital sewing accessories in one easy to get at location - no problem. Folded away the Horn Nova measures 100cm wide, 43.5cm deep, and is 76cm. Large castors make it easy to move around. 3 step Soft-touch air lift system means a gentle push moves your machine from storage to flatbed to free-arm postion and will fit vertually all domestic sewing machines on the market old or new! Spacious, see through door bins make finding thread ect.. easy. 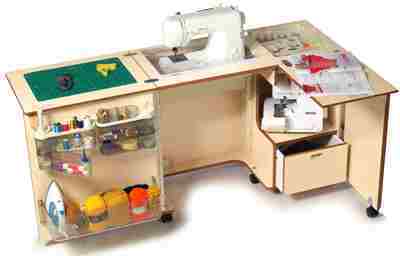 Stores both a sewing machine and an overlocker. Or maybe a second smaller machine. 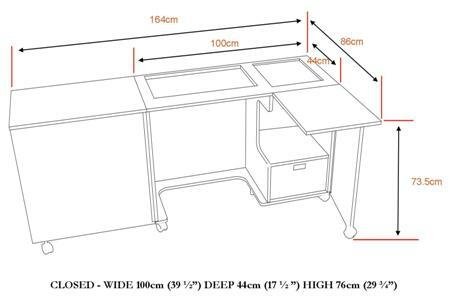 When ordering please can you email us your make and model of machine, so that we can cut the insert to suit. Please allow 28 working days (approx.) for delivery. 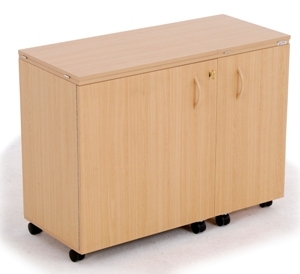 We do not ship cabinets outside of the UK mainland. This is due to their size and weight which incur large shipping costs. Your machine, make and model.